Sun and Water (Mini-Painting as of Jan. 31, 2014), a photo by randubnick on Flickr. 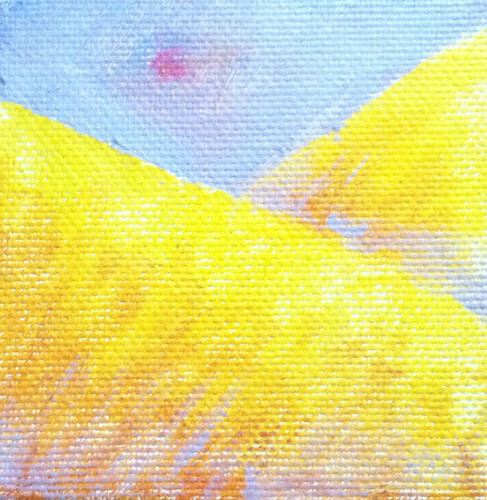 I want to finish up my three mini-paintings, so that's what I worked on this morning. Now I think this one is just about finished. 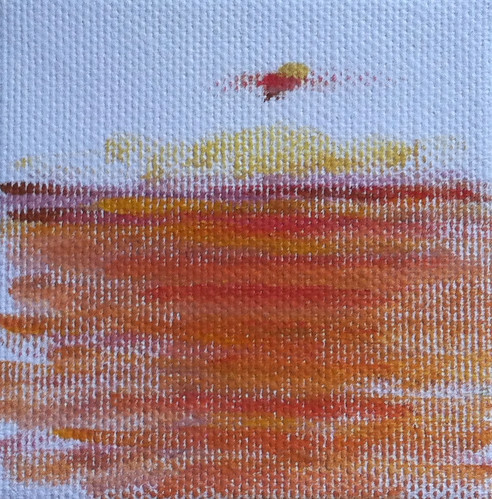 I added pale yellow to the water and to the sun, and used some red to straighten out the horizon line. This is oil bar on a canvas that is 3 inches square. Sketch of My Daughter, a photo by randubnick on Flickr. 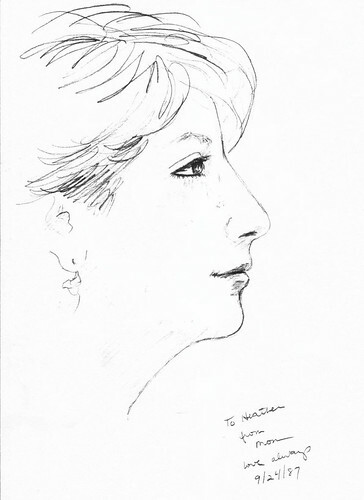 I drew this pencil sketch of my daughter back in 1989. The original version was pencil on paper. She recently came across a photocopy of it and a couple of days ago, she posted it on line as a jpeg. Today I downloaded it into iPhoto where I cropped it and created this black and white version. She said it would be okay for me to post it here. 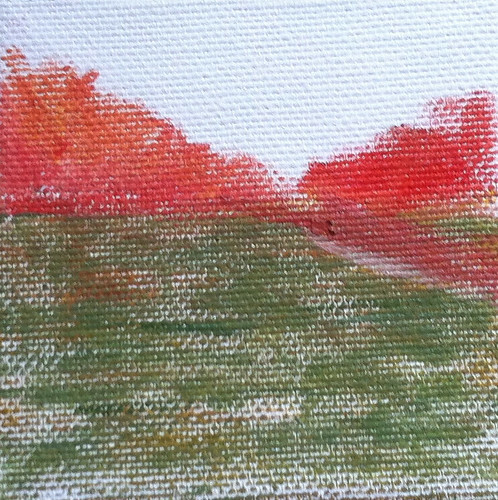 Red Trees and Green Field (Mini-Painting as of Jan. 25, 2014), a photo by randubnick on Flickr. Here is one more mini-painting in progress, as it looked on Jan. 25, 2014. I added color to the sky and to the foreground. This little landscape is getting there, but it is still a work in progress. This is oil bar on a canvas that is 3 inches square. Golden Mountains (Mini-Painting as of Jan. 25, 2014), a photo by randubnick on Flickr. Here is another of my mini-paintings in progress. This is how is looked on January 25th when I worked on it. I added some blue to the sky and I think it is just about done, but there are just a couple of areas that need a bit of cleaning up. This is oil bar on a canvas that is 3 inches square. Sun and Water (Mini-Painting as of Jan. 25, 2014), a photo by randubnick on Flickr. 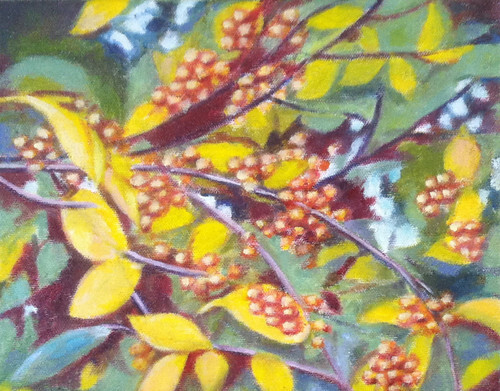 Although I finished my oil bar painting on Jan. 2 ("Branch with Golden Berries", posted here yesterday) I still had three mini-paintings that needed to be finished. So I worked on them over the weekend. I added some blue to the sky on this little landscape, and did some more work on the sun and on the water. I am painting from imagination and memory here. This one still needs more work, but here it is as it looks so far.This is oil bar on a canvas that is 3 inches square. Branch with Golden Berries (Oil Bar Painting), a photo by randubnick on Flickr. Here is my oil bar painting as it looked on January 2, 2014. I worked on defining the lines of some of the branches, cleaning up some of the edges, and then I decided that it was finished. So this is the final version. This is oil bar painting on canvas, and is loosely based on one of my photos, posted here on December 1, 2013. 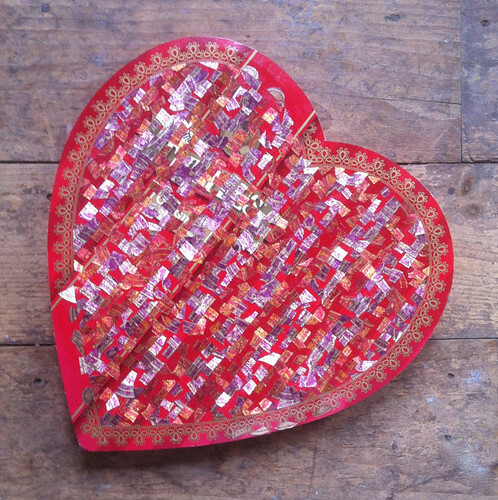 Another Heart Shaped Box as of January 25, 2014, a photo by randubnick on Flickr. 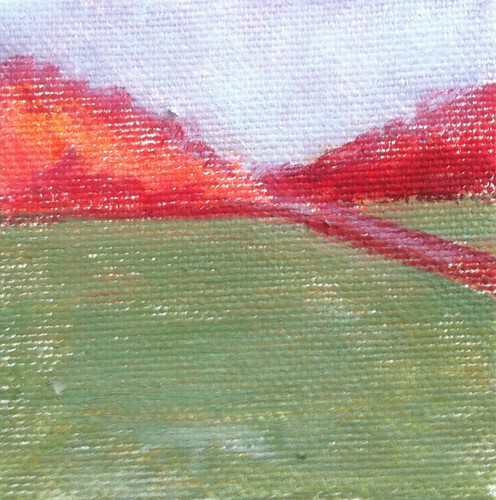 Red Trees and Green Field (Mini-Painting as of Jan. 2, 2014), a photo by randubnick on Flickr. Here is one more of the mini-paintings I have been working on. I usually work on these small paintings as a way of finishing a painting session. 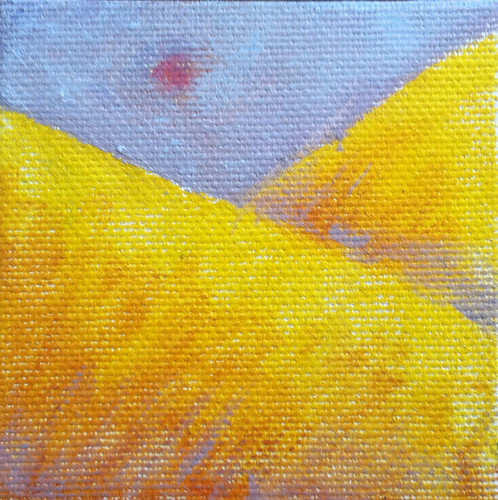 This is oil bar on a tiny canvas, 3 inches square, painted from imagination. I added some color to the sky on Jan. 2, 2014, but as you can see, it is still a work in progress. Golden Mountains (Mini-Painting as of Jan. 2, 2014), a photo by randubnick on Flickr. Here is another of my mini-paintings in progress. This is oil bar on a canvas that is 3 inches square. This landscape is painted from imagination, but I am drawing on memories of my home state of Colorado. On the 2nd of January, I finally added color to this sky, a periwinkle blue. I like the contrast with the yellow, but I will probably tone down the purple just a bit. I decided to put some periwinkle on the mountains as well. Sun and Water (Mini-Painting as of Jan. 2, 2014), a photo by randubnick on Flickr. As I was getting closer to finishing my oil bar painting of golden branches (see yesterday's post), I also was trying to finish up the miniature paintings that I have been working on at the end of each painting session. 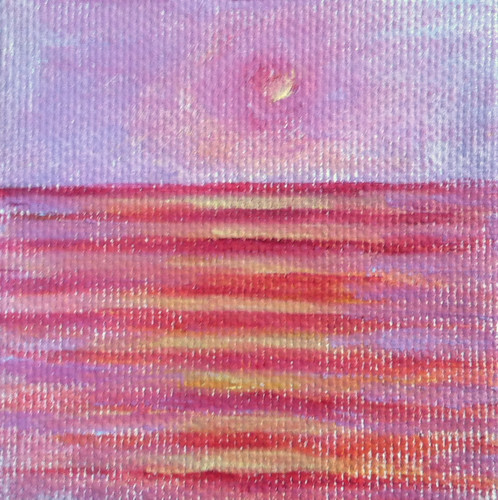 This is one of them, a painting of sun over the water, and still a work in progress at this point. This painting is also done with oil bar, on a little canvas that is only 3 inches square. 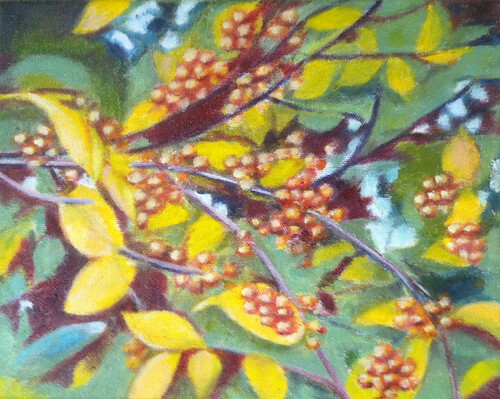 Branch with Golden Berries (Oil Bar Painting as of Jan. 1, 2014), a photo by randubnick on Flickr. I got 2014 off to a good start by working on this painting on New Year's Day. At that point, the painting was very close to finished. So I continued to add definition to some of the lines, and added a bit of light to the leaves. This oil bar painting is loosely based on one of my photos (posted here on Dec. 1, 2013). Colorado Blues (On Display), a photo by randubnick on Flickr. On December 30, I drove in to Boston to Galatea Gallery to pick up two paintings that had been on display in the "Smaller Works Show" in December. The gallery was actually closed to the public that day because the December show had been taken down, and the show for January was in the process of being hung. But my "Colorado Blues" painting had already been hung in the Artists' Alcove, in a display of small landscape paintings. I decided to take a quick photo and here it is. Golden Mountains (Mini-Painting as of Dec. 29, 2013), a photo by randubnick on Flickr. 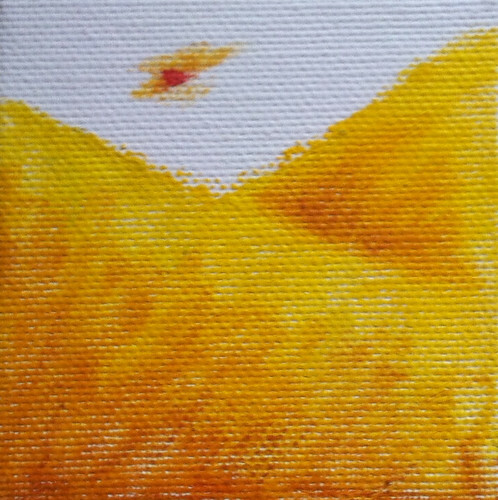 Here's another of my miniature paintings as it looked on December 29th, when I added more red to the hillside and to the sun. This is oil bar on a 3 x 3 inch canvas, and at this point, was a work-in-progress. Red Trees and Green Field (Oil Bar Painting as of Dec. 29, 2013), a photo by randubnick on Flickr. Here is another miniature painting as it looked back on December 29, 2013. (I am still trying to catch up!) This is oil bar on a canvas that is only 3 inches square. I have been working on these tiny paintings as a way to close out my painting sessions when I am working on a larger oil bar painting. What you see here is a work in progress. At the Museum (Sketch in Colored Pencil), a photo by randubnick on Flickr. Last night we went to the Peabody Essex Museum in Salem, MA for one of their Thursday night events. This time, the theme was "La Vie Boheme" to highlight the current exhibit called "Impressionists on the Water" (which I recommend! ), but there were lots of things going on there as well, from French Brasserie food and a talk about French cuisine by Adam Gopnik of the New Yorker, as well as an absinthe demonstration and tours of the Impressionist exhibit conducted in French. 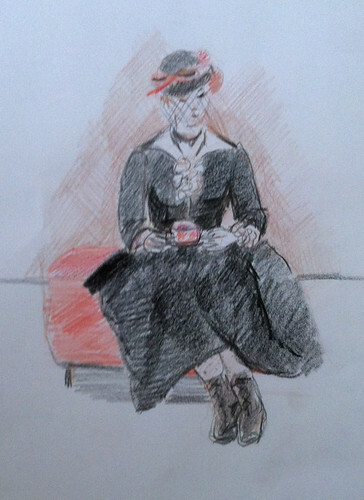 It was almost time to go home when we finally located one of the activities I was most interested in, drawing from a model in 19th century clothing. Time was short, but I sat down and did this quick sketch with colored pencils. The model was great (a redhead wearing all black and white). It was good practice, and I had a lot of fun. Tree Branches All Year (Digital Sketch), a photo by randubnick on Flickr. Tree Branches All Year a video by randubnick on Flickr. 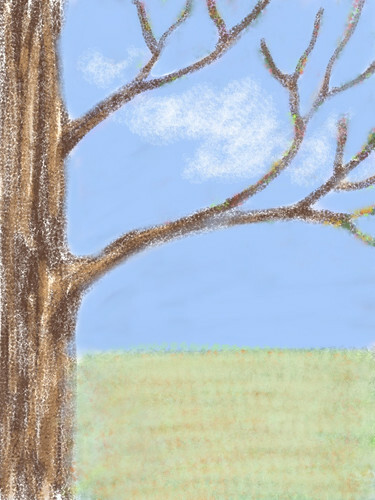 Tonight I used the Brushes app on my iPad to create this little video of tree branches through the year -- in honor of Tu B'shevat (Jewish holiday that celebrates the "New Year of the Trees". 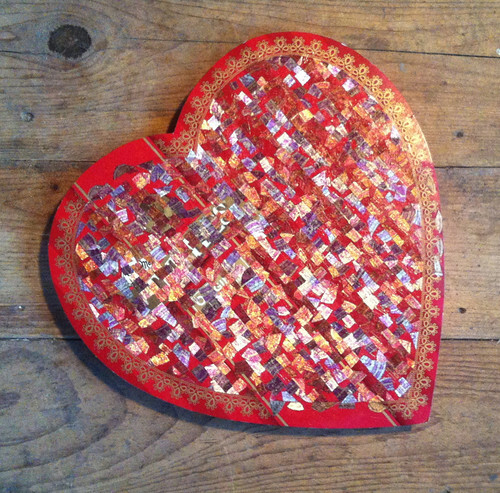 Another Heart Shaped Box as of January 14, 2014, a photo by randubnick on Flickr. 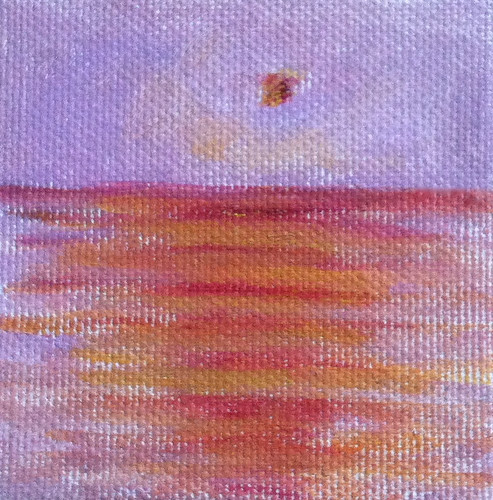 Sun and Water (Mini-Painting as of Dec. 29, 2013), a photo by randubnick on Flickr. On December 29th, I also did a little bit of work on this mini-painting. 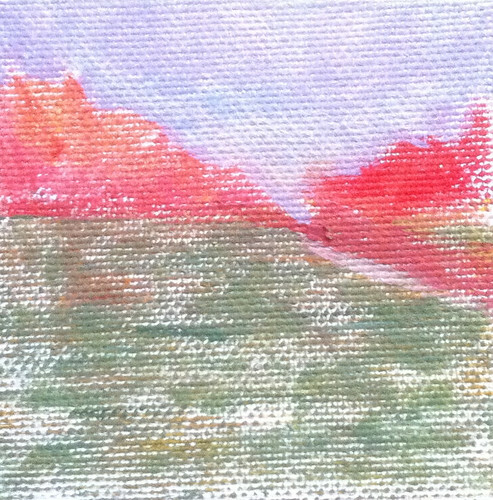 This tiny landscape is oil bar paint on a canvas that is 3 inches square. 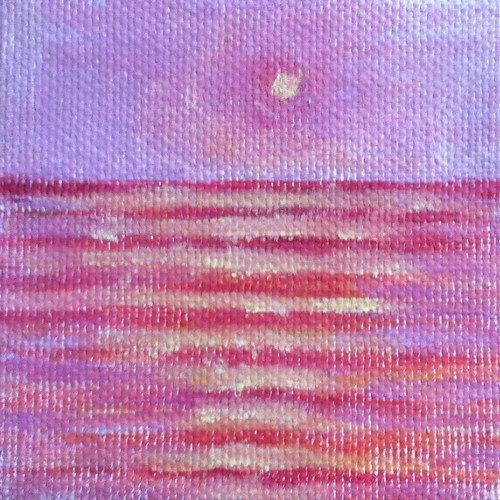 This is going to be a painting of sunlight on the ocean, but it is still a work in progress. 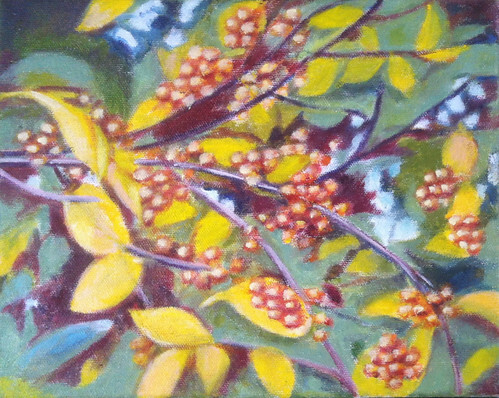 Branch with Golden Berries (Oil Bar Painting as of Dec. 29, 2013), a photo by randubnick on Flickr. On December 29th, I resumed work on this oil bar painting. Because I had been busy painting mountain landscapes with acrylics, I hadn't touched this painting for about a week. It was nice to get back to it. At this point, I was adding light and definition to the leaves and berries, and generally trying to clean up the edges. This is loosely based on one of my photos (posted here on Dec. 1, 2013). Colorado Blues, in Frame (Dec. 27, 2013), a photo by randubnick on Flickr. During the week of December 23, I concentrated on acrylic water media painting, and produced four small works. I had recently learned that I had a chance to display one of my mountain landscapes in the Artists' Alcove at Gallatea Gallery and wanted to paint something new. On the morning of December 27th, I had four paintings to choose from, so I lined them up on the couch and made my decision around 8:45 AM. By 9:30 AM, I had this in a frame, and took this very quick photo. The painting was due that day, and the goal was to get to Boston and turn this in around noon. Made it, with time to relax afterward and have lunch on Washington Street. Four Paintings on the Couch (Dec. 27, 2013), a photo by randubnick on Flickr. 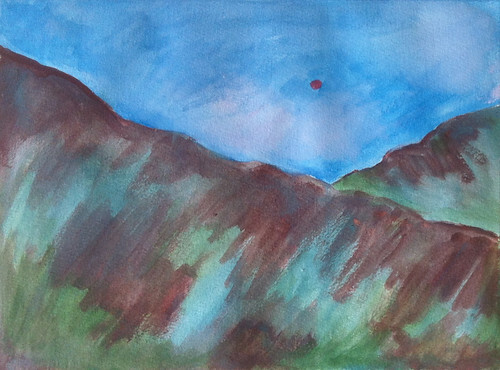 During the week of December 23, I was painting mountain landscapes. By December 27th, I had four paintings done, and I needed to choose one of them to put into a frame and deliver to the gallery that same day. I had been partial to the red painting, but wasn't sure. It was 8:30 AM and we planned to set out for Boston around 11. 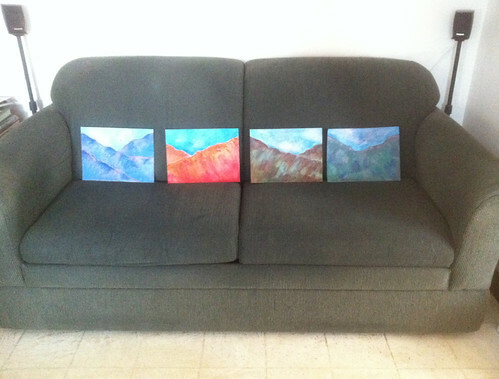 So I lined up the four paintings on the couch to compare. I thought this little couch gallery was amusing, so I took this picture. Looking at the paintings together this way helped me decide, and in fact, I was surprised by my own choice. Colorado Blues (Acrylic Water Media as of Dec. 27, 2013), a photo by randubnick on Flickr. 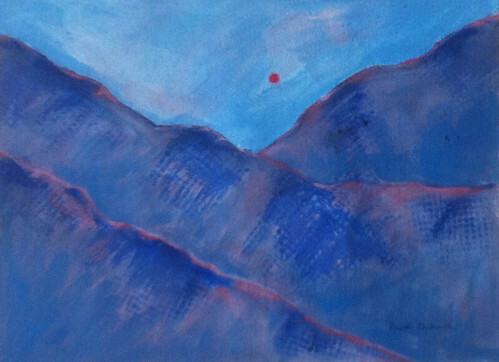 This is the last of the four mountain paintings I produced during the week of December 23. I painted this on the night of December 26, but didn't photograph it until the next morning, which was deadline day, December 27th. This is acrylic paint used as water media on paper. I used some wash-off techniques and painted through netting to add texture. I was painting from imagination, inspired by memories of my home state of Colorado. Sun and Ridge (Acrylic Water Media as of Dec. 27, 2013), a photo by randubnick on Flickr. 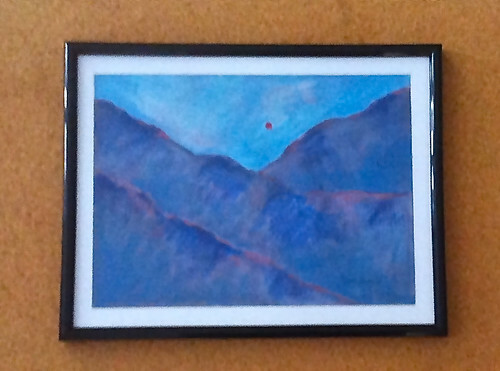 I had been painting mountain landscapes all during the week because I had a chance to put one on display, but it was due on December 27 (Friday). So I kept painting on the evening of the 26th, which is when I finished this one. But I didn't photograph it till the morning of the 27th because I wanted to take a picture in natural light. I added some pink washes to sky, and added pink outline to the edge of the ridge. Sun and Ridge (Acrylic Water Media as of Dec. 26, 2013), a photo by randubnick on Flickr. Here is another of acrylic mountain paintings as it looked on December 26th, still a work in progress. I decided to add some texture by painting over some netting that I had in the studio, and doing some wash-off. This is a technique borrowed from a printmaking class I took a few years ago. I painted four landscapes during the week of December 23 because I was painting for an opportunity to show my work, but it needed to be a small landscape that I could frame and turn in by the 27th. 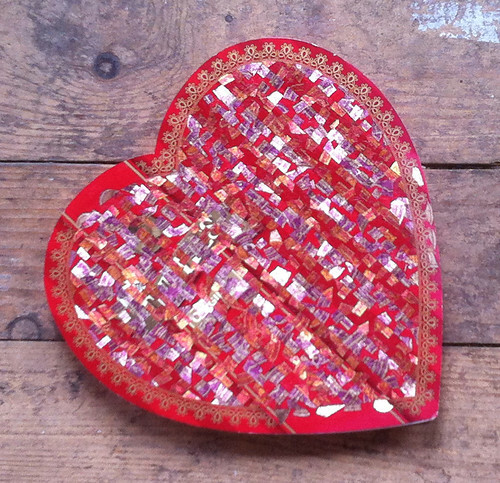 Another Heart Shaped Box as of January 6, 2014, a photo by randubnick on Flickr. Two Mountains in Green and Brown (Acrylic Water Media as of Dec. 26, 2013), a photo by randubnick on Flickr. 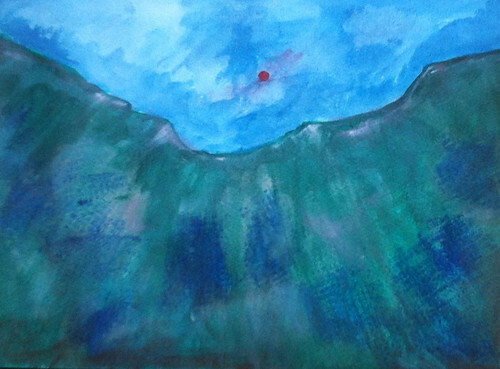 This is one of my mountain landscapes, painted with acrylics used as water media on paper. On the 26th, I worked some more on this painting. 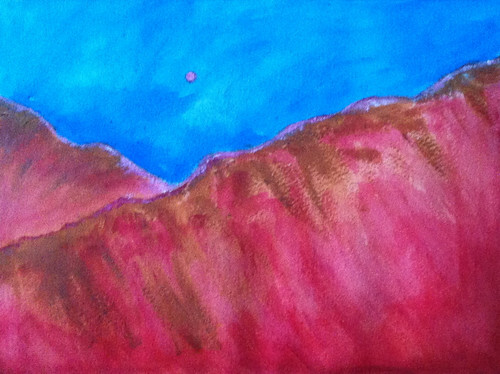 I added more brown tones to the base of the mountains, and added pink highlights to the tops of the mountains. I also did a little more work on the sky. I am painting from imagination here, but inspired by memories of the Rocky Mountains, back home in Colorado. Two Mountains in Green and Brown (Acrylic Water Media as of Dec. 25, 2013), a photo by randubnick on Flickr. 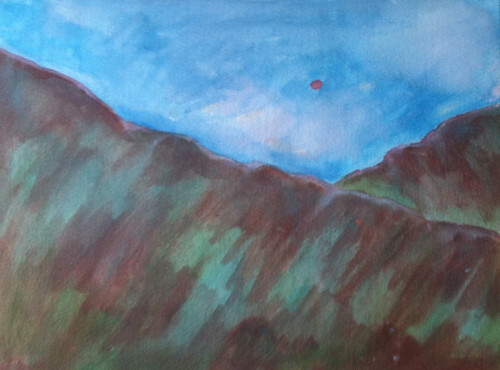 Here's another of my mountain landscape paintings as it looked on December 25, the day I started working on it. This is done with acrylic used as water media on paper, 9 x 12 inches. This is inspired by memories of the Rocky Mountains in my home state of Colorado. Beginning on December 23, I painted mountains every day because I learned that I had an opportunity to show a small landscape painting, but needed to deliver it by December 27. 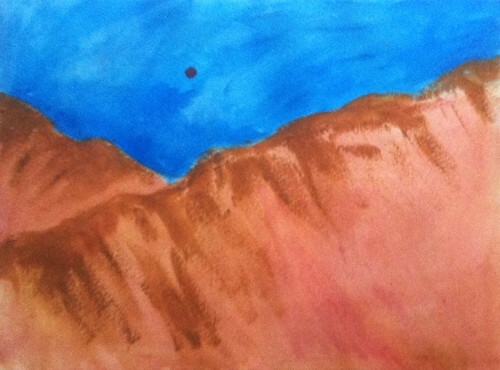 At this point, I was pretty happy with the sky in this painting, but I thought that the mountains needed more work. Back to the Mountains (Acrylic Water Media as of Dec. 24, 2013), a photo by randubnick on Flickr. On December 24, I added some red and pink tones to the painting I had started the previous day. This painting is done with acrylic paint, used like watercolor. My goal was to create several small (9 x 12) paintings, with the hope of producing something good enough to frame so I could deliver it for hanging by the 27th. These mountain paintings are inspired by memories of my home state of Colorado. 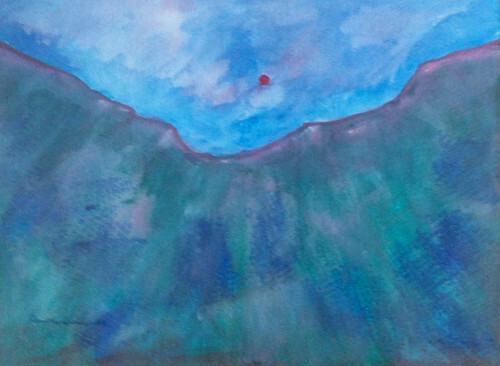 Back to the Mountains (Acrylic Water Media as of Dec. 23, 2013), a photo by randubnick on Flickr. Even though my oil bar painting wasn't finished, last week I put it aside for a few days so I would have time to work in acrylics (used as water media, on paper). 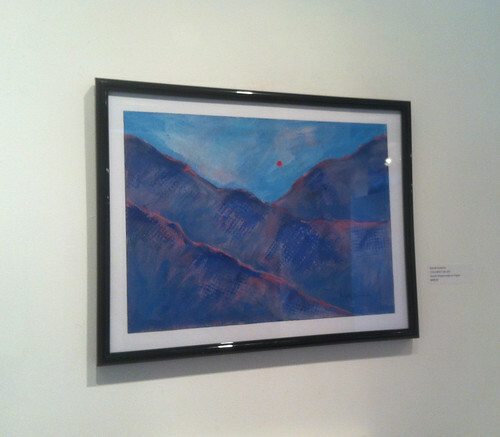 I was asked to display one of my mountain paintings at Gallatea Gallery in January, but time was short! The work needed to be dropped off by the 27th, but there was a size restriction and my existing mountain acrylic paintings were too big. (This is for a small display of landscapes in the 'Artist's Alcove'.) So I decided to create a few mountain paintings over the course of a few days, and then frame the best one and deliver it to Galatea Gallery by the 27th. So this first of this set of mountain paintings, as it looked on December 23. I decided to call it "Back to the Mountains." Sun and Water (Mini-Painting as of Dec. 21, 2013), a photo by randubnick on Flickr. Here is another mini-painting (in progress) as it looked on December 21, when I added some more color to it (plum and orange). This is oil bar on a canvas that is 3 inches square. 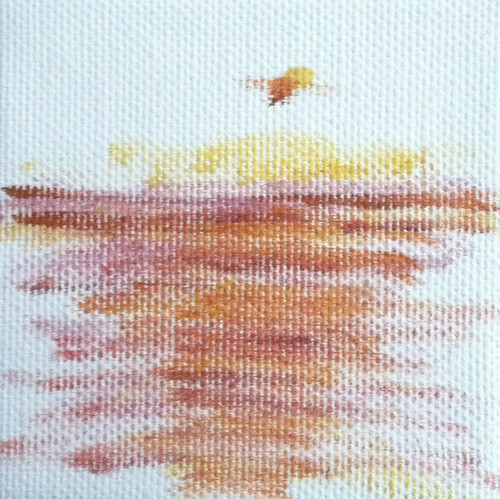 I have a little group of these tiny paintings to work on at the end of a painting session. This is going to be a view of sun over the ocean.